A lightly camouflaged BMW i8 test vehicle was spotted in Germany and while it doesn’t feature any design changes, it brings forward some possible upgrades to the tires selection. 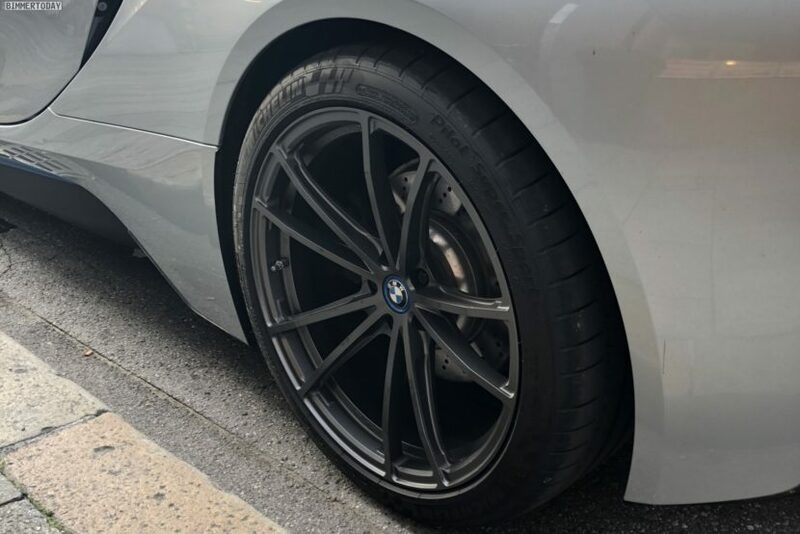 Sitting on Michelin Pilot Super Sport, this i8 now makes use of tires that 245 millimeters wide at the front and 275 mm in the back, 30 mm wider than the largest tire currently offered by BMW for the i8. The increased width points to the need for extra traction and enhance driving dynamics, which would fall inline with the long-time rumored i8S. But according to our information, there are currently no concrete plans for a more powerful and sportier positioned BMW i8s, so perhaps drivers in need of higher cornering speeds with their i8 can at least look forward to wider tires from the factory. In addition to the sports tires, the prototype also carries the additional attachments of the optional aerodynamics package, which provides more contact pressure on the front and rear axles. As standard, the BMW i8 facelift is available on 20-inch wheels with 195-millimeter-wide front tires and 215-rear tires. The tires, which are very narrow for a sports car, help the hybrid sports car to achieve an extremely low fuel consumption: 1.8 liters per 100 kilometers, according to WLTP, which corresponds to CO2 emissions of 42 grams per kilometer. The electric range of the facelift i8 has risen to 55 kilometers since the facelift, a figure that seems to satisfy most city drivers. When the electric motor sends its peak power of 143 hp to the front wheels and the 231 hp of the three-cylinder petrol engine are retrieved in the rear, the i8 accelerates to 100 km / h in 4.4 seconds. The intermediate sprint from 80 to 120 is also completed in fourth gear within 3.4 seconds, the top speed is 250 km/h.